Who Else Wants Answers On How To Overcome Grief? 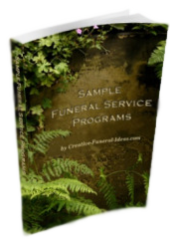 Are you wondering how to overcome grief, having experienced the loss of a loved one? When grief first occurs, everything feels so alien. Help is needed. If you have a church affiliation, they can be a tremendous source of strength. However, even with a religious support group, that may not provide you with enough emotional first aid. I woke up the morning after my husband died and started counting. That was one day done. If I could make it through one day, I could make it through two. I have been counting ever since, sometimes it is in days, and sometimes it is in months. Like an alcoholic in the program I initially survived one day at a time. On the very very worst days I counted a different way, a darker way, I promised myself I would endure this life for only as long as he had been given, fifty years one month two days. I didn't want a single day more than he had. There was one particularly bad day when I worked out I had only seven years, four months and six days to put up with this life before I could reasonably bow out. I don't believe I was actually suicidal. For me it was all about control. I had lost control over my life and I was making bargains with myself to bring the control back. Even on the darkest days there was so much remembered joy. I had had a charmed life with a true soul mate. It wasn't for long, only nine years, but it was so fantastic whilst it lasted. We had met and fallen in love and married on a Caribbean beach at sunset, we had travelled the world, had adventuress, laughed so much, and achieved so much. And in an instant he was gone, when he died of a massive brain haemorrhage. No warnings, no signs, he literally just dropped dead in front of me. Because I knew the man I can even find comfort in that. He would have hated being sick. I know it sounds strange but for him it was the best way to leave this world – no pain, no sickness, just one flash of light and he got all the answers to the questions we ask ourselves in the middle of the night. For 12 years I was a therapist working in social care, I rose to become Director of Care with a childcare organization and I still occasionally take on private clients for counseling. 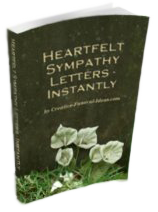 I have dealt with various aspects of grief in clients and the knock of effects from post traumatic stress to profound depression. I am also a former journalist, I own a medical tourism company and I lost my husband suddenly and traumatically 18 months ago. 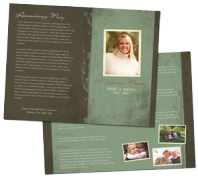 When I was going through the initial stages of grief, and struggling with how to overcome grief, I desperately felt the need for a monthly newsletter support system. It is comforting to learn of other people’s experiences and stories as they resonate so profoundly. 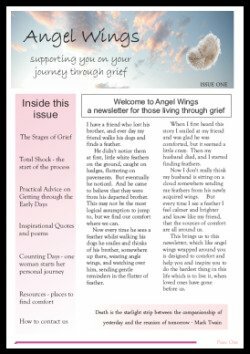 You are invited to download a complimentary issue of Angel Wings Newsletter; offering you support to help you overcome grief.